The all-season Sailun Terramax H/T tire features a tread pattern that delivers both highway and off-road traction. Its full-depth sipes enhance grip in wet and light snow conditions while the wide grooves expel water and mud to enhance ride safety and traction. Designed for light trucks and SUVs, the Terramax H/T offers comfortable rides on the road thanks to the optimized block arrangement. The tread compounds are formulated using environmentally friendly processes and provide high resistance to wear for longer service. 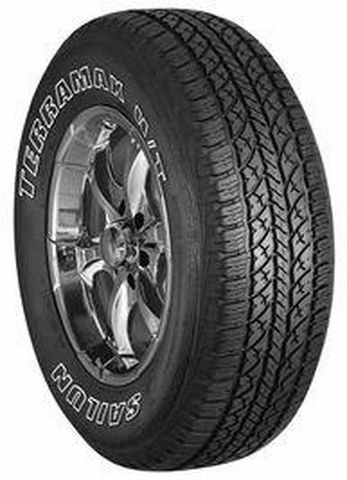 245/70R -16 500AB 2,150 lbs 44 psi 11/32nds 7" 10" N/A 30"
Purchase includes the Sailun Terramax HT tire only. The wheel rim shown in the picture is not included. Picture provided is a stock picture from the manufacturer and may or may not reflect the actual product being ordered. All Sailun Terramax HT tires are continuously developing with manufactured improvements. With that said, Simple Tire and the manufacturers have the right to change these tire specifications at any time without notice or obligation. Please Note: Specifications of the Sailun Terramax HT tires shown above are listed to be as accurate as possible based on the information provided to us by Sailun tires. I purchased mine and had them delivered to the tire store for installation almost exactly two years ago without any rotation, I'm ashamed to say, however the rear tires look like almost new and the front tires don't look bad at all, so I'm kind of amazed by the tires. I've had zero issues and I'm going to buy another set in May just because I've had the ones I've had for 2 years, including a spare that I bought at the same time, I bought a total of 5, the spare, of course, has never been used since I've had no issues, thank God, and I've driven over 40,000 miles on the set of four driver's that I have on now. I have a Chevy Trailblazer. I like these tires they've been great for me. I am replacing ours now as my last ones have over 45,000 miles of hauling our 18,000 lb 5th wheel trailer all over the country. The tread is about worn out and I have new ones sitting in the shed ready to go before our next trip. Zero problems with the last set and loved how they handle and how quiet they are. Pretty normal tire. The vehicle is new to me. Nothing to compare against. Slips a lttle on wet concrete road in turn with a bit of accelleration. Behaves god under heavy load. 30 k miles and most of the tread left. By submitting a review, each person received a sweepstakes entry.